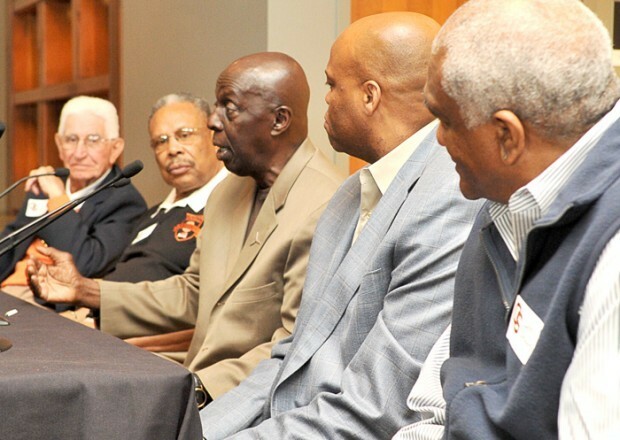 Basketball Desegregation Event Now Online! Last Spring term OSU’s AFAPC (Association of Faculty for the Advancement of People of Color), along with the generous support of Varsity “O” and the Office of the Vice Provost of Student Affairs, organized an event to share the untold story of the desegregation of Oregon State’s men’s basketball team and the event is now available online along with the full transcript of the speakers. What began as AFAPC’s small idea to host a film screening of the 2006 movie Glory Road and facilitate a discussion for about 25 people turned into a major event attended by over 150 people from the OSU and Corvallis communities! The event included a presentation on the history of college basketball desegregation in the United States and the history of the desegregation of OSU’s men’s basketball team by Sociology Professor Dwaine Plaza and Oregon Multicultural Librarian Natalia Fernández. The panel discussion was facilitated by Dawn Wright, professor in the department of Geosciences. Note: The event also included about 25 minutes of clips from the film Glory Road aired after the presentation, however the online version does not include the scenes from the film. We had the opportunity to record interviews with both Norm Monroe and Charlie White the day after the event. Those recordings and transcripts will become available later this year. And of course, we will be sure to blog about it! This entry was posted in OMA and tagged African Americans. Bookmark the permalink. 2 Responses to Basketball Desegregation Event Now Online!